Anthony Downer, one of the founders of the Leaders of Color Program, speaks to first-year Mary Blair. Leaders of Color (LOC), a student run initiative at the Institute of Politics (IOP), is celebrating its one year anniversary this month. 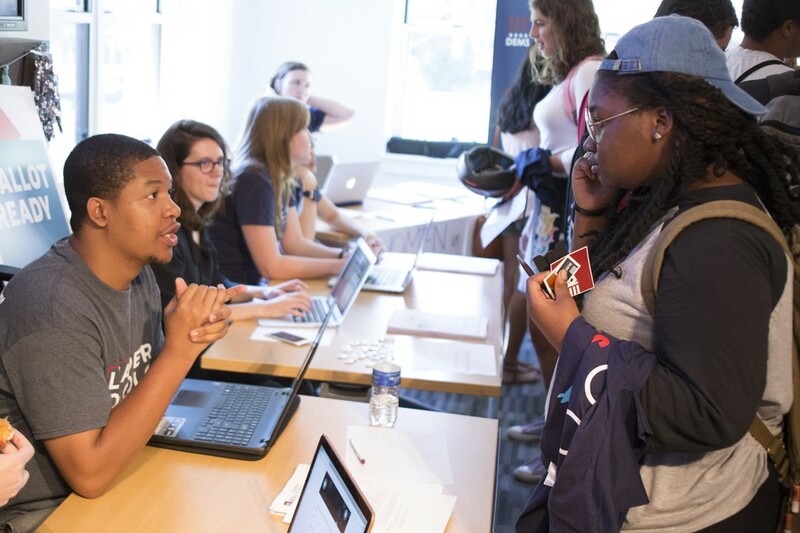 LOC was founded by Jamie Sanchez (class of 2015), Nina Katemauswa (class of 2016), and Anthony Downer (class of 2017) and works to increase the presence of students of color in leadership positions around campus, particularly at the IOP. Downer noted that he was very involved at the IOP, but when he went to events there he was one of the few non-white students there, and students of color in the leadership positions were scarce across the university. To address those issues, LOC offers a 10 week program in professional training in the winter quarter to approximately 30 first and second-year students of color in the college. This training includes resume writing, interview and networking practice. Then in the spring the same group is put through a mentorship program and exposed to professional leaders of color. “The winter quarter includes a lot of career advancement oriented projects, such as resume and application writing. During the spring quarter we do a lot of site visits, and bring speakers in to talk to the cohort, and introduce them to leaders of color out in the real world. Spring quarter is also when the mentorship program kicks in,” fourth-year and mentor Justin Narges said. According to Downer and Narges, the IOP and University have supported LOC by providing guest speakers and University faculty and staff to provide mentorship to younger students on a variety of subjects, such as community leadership, University navigation, and RSO participation. “A large part of why I joined was because I felt I could benefit from it on a white campus. I think as students of color we are in a position where we need to put our best foot forward at all opportunities,” first-year Mary Blair said. “Our goal at the end of the day is to become the biggest network of students of color at the University. What that means is partnering a lot with student groups bringing them all together,” Downer said. LOC is part of the IOP’s Student Civic Engagement Program, which assists students in projects in a wide range of community efforts; including BallotReady, Chicago Bound, Chicago Peace Corps, Maroon Veterans Alliance, New Americans UChicago, TechTeam, TurboVote, and Women in Public Service.